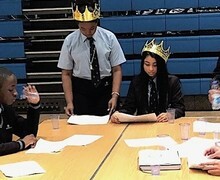 Pupils got to grips with their study of Shakespeare’s Macbeth by acting out the banquet scene in which Macbeth sees the ghost of his friend and eventual rival, Banquo. The scene is considered to be important as it is point at which Macbeth’s fall into paranoia begins. English teacher, Mr Wiltshire said: “pupils delivered some really impressive performances, considering they only had one lesson to prepare”. 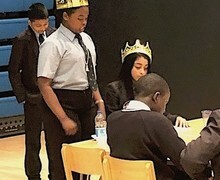 Leading academics believe Shakespeare can be made more meaningful to students if his plays are treated as scripts to be performed and not just text on a page to be read.